The Monkees had become an international phenomenon after their first album and single reached the top of the charts, so it was only a matter of time before their second album and single would be released. "I'm a Believer," their second single and their second straight No. 1 45, was released in December 1966, but the release of an album came later. Supposedly unbeknownst to the bandmembers, Don Kirshner released "More of the Monkees" in February 1967. The album also reached the top of the charts, but its release also signaled that all was not right in Monkeesville. As an album, although not as good as the first LP, this record had numerous fine moments mixed in with some less than stellar material. The LP opens with one of the group's best efforts, "She," but it is followed by the less than praiseworthy "When Loves Comes Knockin" (At Your Door)," which was a knockoff of the hit "Forget Him" by Bobby Rydell. Two terrific tunes follow: Mike Nesmith's "Mary, Mary" (a song that gave the Monkees some street cred as it was covered by the Paul Butterfield Blues Band) and "Hold On Girl." Peter Tork received his first lead vocal on the novelty tune "Your Auntie Grizelda," a song that perpetuated the myth that he was the "dumb" Monkee. It has since become one of the group's most popular in-concert offerings. The album's nest three songs are all top-notch: Tommy Boyce and Bobby Hart's "(I'm Not Your) Steppin' Stone," Neil Dimaond's "(Look Out) Here Comes Tomorrow," and Mike Nesmith's "The Kind of Girl I Could Love" stand up to anything the band ever recorded. 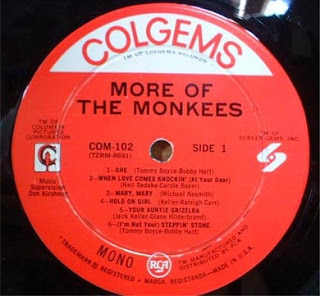 However, it is followed by what is perhaps the Monkees' worst recording, "The Day We Fall In Love." This tune was certainly included to capitalize on Davy Jones' popularity with the girls, but it is pure trash. 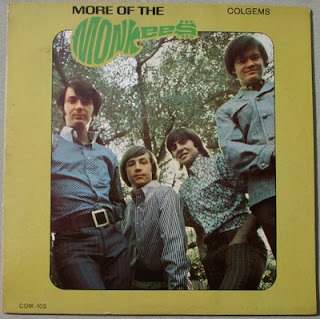 Next comes Micky Dolenz's favorite Monkee song, "Sometime in the Morning," and if you had any doubt about his vocals, his performance on this song puts them to rest. Again, a great tune is followed by trash, this time, "Laugh," another one of the group's poorest songs. 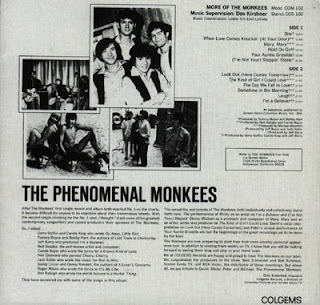 However, it is picked up by probably the group's most famous and best song, "I'm a Believer," the aforementioned top of the charts tune that cemented the Monkees' place as hitmakers of the highest order. Neil Dimaond's tune captured the time, the momemt and the top spot on the Hot 100, and to this day stands as a classic recording. Problems were beginning to percolate, though. Kirshner continued the use the formula of having minimal instrumentation provided by the band itself, and Micky, Davy, Peter, and primarily Mike were starting to get unnerved about the entire affair. The release of this album, with the band in their JC Penney attire, stirred negative feelings in the foursome that were really never overcome, even after Kirshner was subsequently shown the door. This is the original mono album from the actual mono release, and the album can be found at http://launch.groups.yahoo.com/group/albumania/.